Pricing – How much does it really cost? Recurring monthly fee – A monthly fee is paid to access the reporting system. There may be a limit to the number of reports that you can do for free, so be sure to check this. Also, ask about upgrades. Are there upgrade fees on top of the monthly costs or all all upgrades included in the cost? Per report fee – You pay a fee for each report you create. The average price for a report is around $3-$6. This is great for a new inspector with a tight budget, but keep in mind that if you grow your business to just 20 inspections a month, you’ll be spending $120 in monthly fees or be forced to learn a whole new system. One-time payment – You purchase the program for one price and can create unlimited reports. There are no monthly or per inspection fees and once you purchase the home inspection software, it’s yours forever. These programs are typically more expensive up front, but can save you some money in the long run. Be sure to ask about upgrade costs. many companies claim a one-time fee then charge you $300 per year to keep the software up to date. One time fee software can quickly become more expensive than monthly subscriptions and they usually update and add features much less often. If price is a significant factor in finding the best home inspection software, try to weigh the short term and long term benefits of each option. A few more things to consider in terms of cost are the customization options of the program. Do you have to pay for additional templates or can you create your own? Is technical support free or will it cost you an arm and a leg if you need help? The ability to create custom reports is a feature that every inspection software should have. If you’re a new inspector it’s hard to predict what sort of item you’ll inspect in the future and what wording you’ll choose. If you’re a veteran inspector who’s upgrading to a new software system, then you’ll want to try to replicate your old process as closely as possible. A program that is customizable will allow you to create reports that will fit your business needs. Clients and realtors love summary pages. If you want to include a summary page in your reports, make sure the software you’re considering makes this an easy process. The ability to save comments to re-use later can save you countless hours of typing. Some questions to ask about the program are: can you add comments to your library easily? Are they easy to find when you need to use them or is each comment 4 clicks away? Can you insert only one comment at a time or can you click multiple comments to insert into your reports quickly? Is there an existing comment library to choose from or do I have to create all my comments from scratch? A professional inspection report will always include photos. Does the software you’re considering allow you to add photos? Can you circle problem areas or use arrows to point out specific issues? Since you’re inspection report is helping clients make one of the most important decisions of their lives, the report needs to be as professional as possible. A spell check feature will ensure there are no spelling errors in the report. The ability to customize and save different types of templates will save you time and allow your business to expand with your capabilities. You should be able to customize and save your own templates and then load them later to perform different types of inspections. Some programs have the ability to manage scheduling and handle client contacts. The question to ask here is whether or not these features are worth the extra price you’ll pay for them? Many times the bells and whistles cause the product to cost more when you can actually find products that are much better for free. Take the line of Google products for example. You can share documents, schedule all your appointments online, and manage contacts all for free. We use Google to manage many aspects or our company and it costs nothing. You’ll probably never see efficiency listed as a major feature of any software program, but the way a product functions can determine if you’re getting reports done with ease or sitting there half a night being frustrated. I like to refer to efficiency as the number of clicks or the amount of effort it takes to get something done. When you start the program, is it a big task just to get start on the report? Is it easy to navigate between sections, subsections, and individual topics? Can you insert comments easily? Can you remove or add items on the fly to adapt to unique situations in the field? Is there a print preview or do you have to generate a report every time you want to proofread? The best home inspection software should allow you to navigate smoothly through the entire reporting process. Easy to learn and use? Have you ever bought a large computer desk that you had to put together yourself? After about 4 hours of hardware and particle board mayhem you were probably on your last nerve. Digging into a complicated software program with inadequate training will give you the same frustrated feeling. To save yourself a lot of headache, make sure the program you’re considering is easy to use and learn. Does it have a large complicated instructional manual? Are there any training videos that can help you learn the program more quickly? If you have questions or technical issues, is there a number you can call for support? We truly believe that we have the most easy to use home inspection software available. A software that you can’t use is worthless, so it’s important that any product you purchase has excellent tech support to back it up. Before you purchase a program, send an email or call the company with a technical question. See how long it takes to get a response and you’ll have a good idea of what kind of customer service you’ll receive. 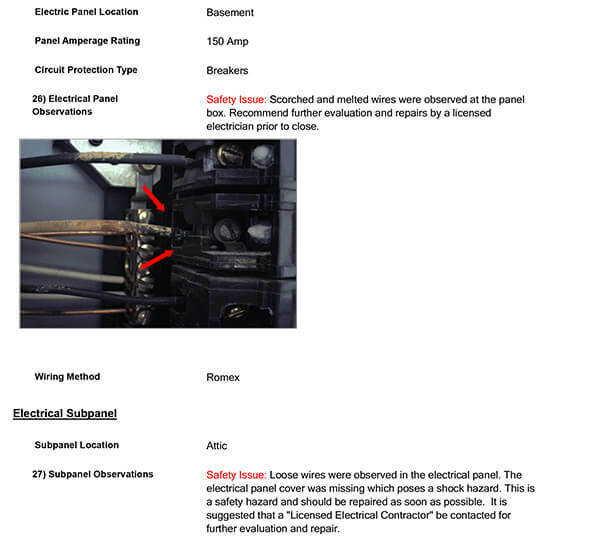 It’s easy to forget sometimes that the most important aspect of inspection software is the report output. The report is what the client and realtors will see as the final product and it’s what represents your company when you’re not there in person. Clients want an easy to read and well organized report with color photos. It’s that simple. If you view a report sample and get confused in the first 3 seconds, chances are it’s not the best format. You shouldn’t have to “learn” how to read a report, and neither should the client. You can save time and impress clients with professional home inspection software and great looking reports. To find the best option for you, first decide what you need it for. Then use the information above to go out and find the most simple and affordable solution that will fit your business needs. Is EZ the best home inspection software for you?